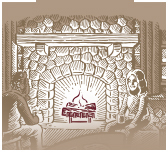 For years our family has tinkered around with new and exciting cider based beverages. In that time we've been fortunate enough to have plenty of willing guinea pigs when it comes to taste testing. Below are some of the gems we've uncovered from scavenging recipe books, polling customers, and experimenting at holiday parties. 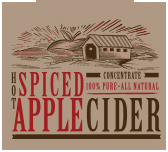 We are always on the lookout for interesting new applications for our hot spiced apple cider concentrate, so if you come up with a good one, feel free to drop us a line.